Undoubtedly, there are some pretty neat email applications on iOS platform but we still have to cope with managing them. Emails from work place to sports magazine subscription emails, users find trouble managing them and sorting them out. Its not like emails cannot be managed on applications, it just requires a lot of time to do so. The time acts as compulsion for users to procrastinate and in the end the list keeps piling up. But what if we told you guys a way to manage emails without even opening the app? How about managing emails wherever you are on the screen? Its true, you don’t even have to unlock your device to do it. With this build up, the eMail Widget takes center stage. 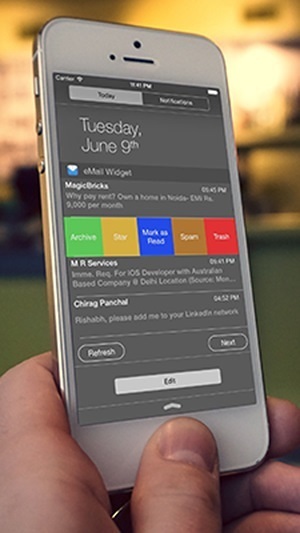 eMail Widget is a widget app that sticks in your notification center and lets users manage any kind of email with ease. Lets see eMail Widget in a bit more detail. Your email inbox has never been this close to your fingers with eMail Widget. Work with emails the easy way, no need to open the app or go to your host email website. 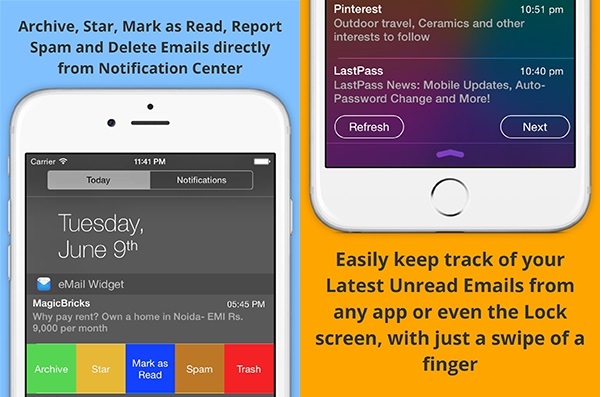 Once you install the eMail Widget from the App Store, all you need to do is provide your Google Apps credentials or your email account details to the Widget app. Currently, these two are the only options available with more still in the pipeline readying for a later launch. After you provide your specific details to eMail Widget, you will see your inbox in the Notification Center. If you have the Notification Center enabled on your lock screen as well then you can manage your emails without unlocking the device too. The eMail Widget is really handy for accessing and managing emails, right at your finger tips. There is more with eMail Widget than just looking. It enables users to swipe and veil controls and options available like Archive, Mark As Read, trash, Spam, Delete and more. All of this can be done without opening the app. It is available for all iOS devices for $1.99 and can be downloaded from the App Store. The eMail Widget is a great tool if you have a lot of emails coming. This is it for now, folks. Do give this widget a swirl and let is know how you liked it.